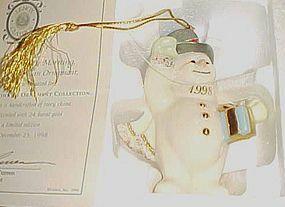 Limited Edition Lenox Christmas ornament titled "A Frosty Morning. 1998. Comes complete with all original packaging and certificate. 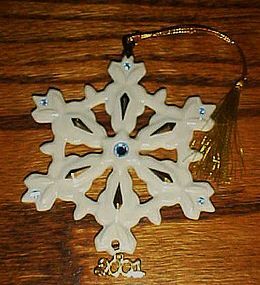 Measures 4" tall Real gold trim and gold hang tassel. Pristine condition. 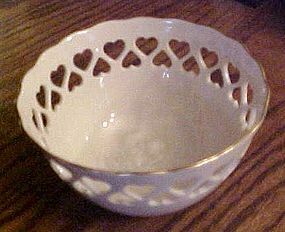 LENOX Beautiful Large Lenox Bowl with pierced hearts around top. Raised 3 Dimensional embossed rose in center of base approx. 3 1/8" tall x 5 5/8" width hand decorated 24K gold trim on top edge back stamp mark : "Lenox Made In USA" Excellent Condition -- Like New! No chips, cracks, hairlines, crazing or repairs. 24K gold trim Is undamaged. I have a matching vase listed also. This is a lovely used Lenox China Heart Vase with reticulated hearts and a rose design. Highlighted with gold edge trim. (5 3/4"tall x 3"daim.top / 2 3/4"diam. bottom) PERFECT condition with no issues. See the matching bowl I will be listing. Lovely LENOX cabinet kept 3 pc set of the original black mark "The Autumn" china. Flat cup (with stripe on handle) and saucer and the 8 1/4" salad plate. This makes a lovely set for tea and dessert. Lovely fruit basket pattern with enameled relief fruits . Delicate border pattern embellished with gold. Appears to never have been used. All three pieces are pristine! 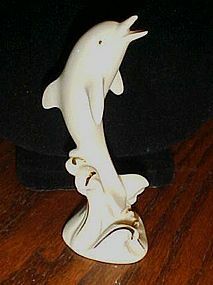 Lenox signed ivory ceramic dolphin on waves, Lenox signature gold edging on waves and dolphin's eyes. Like new unused condition. 4" tall, so will fit in perfectly anywhere. 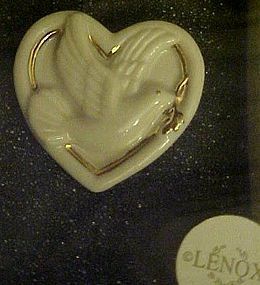 Heart shaped Ivory/white color with gold trim & Peace Dove with Laurel Branch by Lenox. Measures 1 3/8" x 1 3/8". perfect with original box. No signs of wear at all . Discontinued Classic candy dish by Lenox in excellent condition. Large dish appox size 8"x4 3/4. The rim of the dish trimed in 14k gold follows the doves outline details on the inside of dishes reveals the doves delicate feathers crafted of lenox ivory fine china. Perfect condition with NO damages. I have 2 available. Price is per dish. 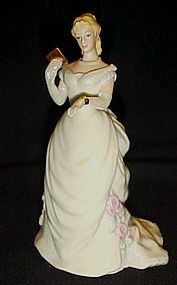 Lenox Pretty Lady Figurine "Moonlight Waltz" Bears the Lenox hallmark. 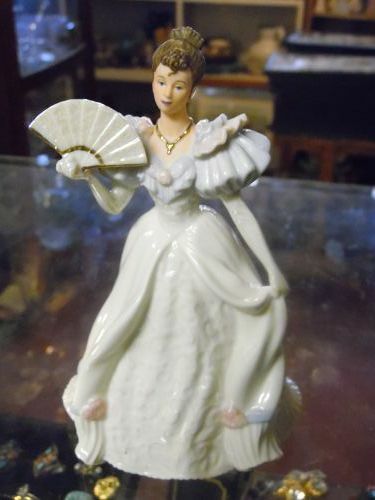 This pretty figurine measures 6 inches in height. Delicate features and detiling. It is not brand new but looks it, and is in EXCELLENT condition. There are NO FLAWS OF ANY KIND that I can see. No box. 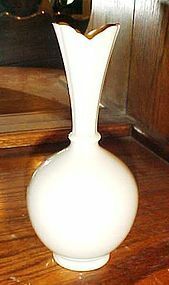 Pretty and elegant bud vase made of Lenox creamy colored porcelain. Design has delicate beading which gives it a Victorian flair. 24K gold trim. The beading actually looks like the candlewicking women used to do on fabrics long ago. Measures 5 1/8" tall and is in pristine condition. Replacement 10 5/8" Dinner plate for your Lenox Temple pattern dinnerware. Made in USA. 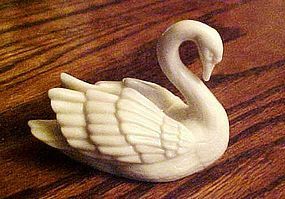 This pattern was made 1936-1978, and is now discontinued. 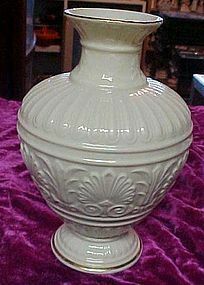 Pretty cream color with ribbed design, no decoration. We will be listing more pieces of this pattern. We have 4 of these plates available. All are perfect and damage free. Price is for 1 plate. 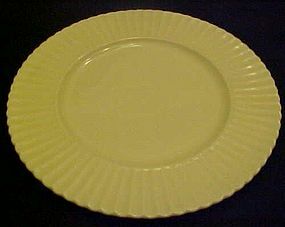 Replacement 8 3/8" luncheon or salad plate for your Lenox Temple pattern dinnerware. Made in USA. This pattern was made 1936-1978, and is now discontinued. 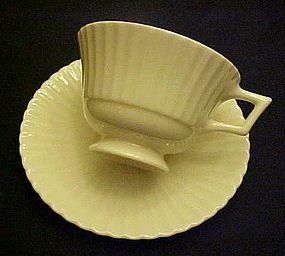 Pretty cream color with ribbed design, no decoration. We will be listing more pieces of this pattern. We have 3 of these plates available. All are perfect and damage free. Price is for 1 plate. 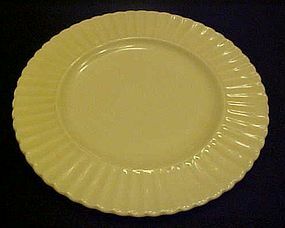 Replacement 6 3/8" bread and butter plate for your Lenox Temple pattern dinnerware. Made in USA. This pattern was made 1936-1978, and is now discontinued. 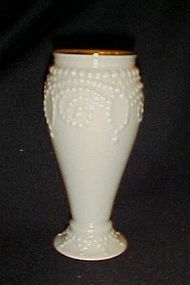 Pretty cream color with ribbed design, no decoration. We will be listing more pieces of this pattern. We have 3of these plates available. 2 are perfect and damage free, the 3rd has a chip and is 1/2 price. Price is for 1 plate. 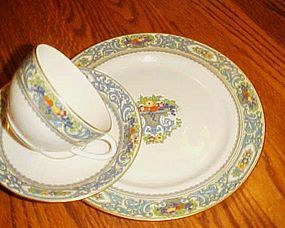 Replacement cup and matching saucer for your Lenox Temple pattern dinnerware. Made in USA. 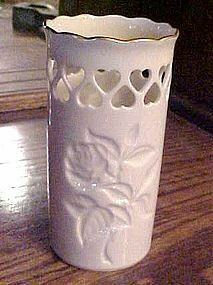 This pattern was made 1936-1978, and is now discontinued.Pretty cream color with ribbed design, no decoration. We will be listing more pieces of this pattern. We have 4 sets of the cups and saucers available. All are perfect and damage free. Price is for 1 cup with matching saucer.